Equipment is approximately 69” square x 199¼” tall. 2-ton Harrington electric chain hoist with motorized trolley, nylon energy chain package, and Spider-Lift™ bulk bag lifting frame. 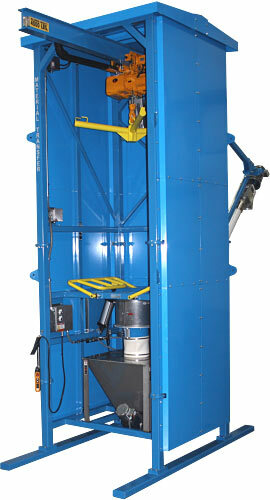 Unit features custom carbon steel shrouding for the unloader framework. Flo-Master™ bulk bag massaging system with exclusive welded, tubular arm design, promotes positive material flow. Exclusive aluminum Seal-Master™ bag spout access chamber. 12” diameter carbon steel product discharge transition. Unit features a custom stainless steel hopper and screw conveyor connected to transition by a flexible rubber connection. Base of unit includes two (2) tubular steel outriggers. Unit frame includes eight (8) welded steel mounts to accept customer supplied guy wire system.